After all the discussion, all the speculation, and all the questions, Lucifer finally introduces The Sinnerman. And what an interesting introduction it is, because there’s now even more speculation and questions about The Sinnerman after this episode. 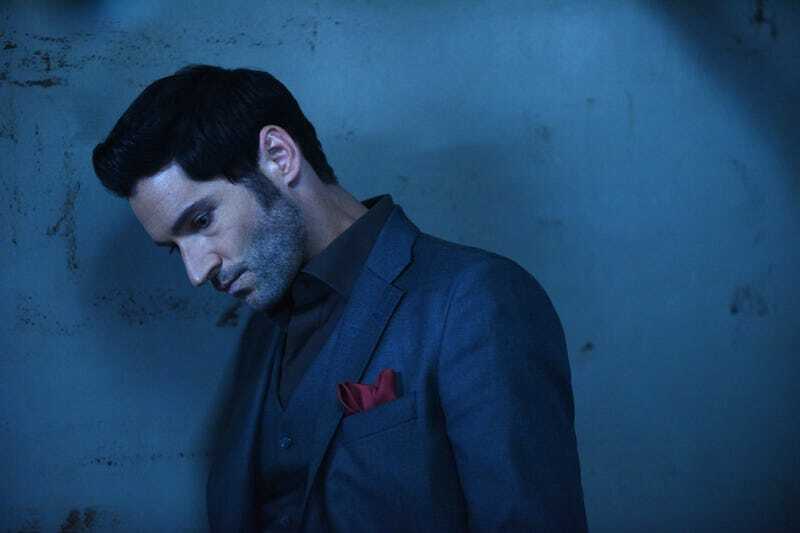 “The Sinnerman” is a strong episode of Lucifer, but for all the solid moments that come out of it, the actual Sinnerman beats are the ones that fall short in comparison. But it’s not so much in terms of a quality level as it is relative to the anticipation for the character. Obviously, expectations and reality don’t always mesh, but getting our first taste of The Sinnerman in this episode, it’s worth asking if this fully falls in line with all the build-up. The little bit we get of The Sinnerman here doesn’t quite help us understand anything about the character; and while that may sound like a cry for all the answers at once, that’s not exactly the problem either. There’s just some confusion as to how to reconcile the menace who lures Lucifer into a trap (though that doesn’t involve him actually trying to do anything other than just contain Lucifer) with the guy who has no plan when he starts a gunfight with the LAPD (other than to just have a gunfight). If there’s a method to his madness—and based on all of this, it is madness—then it isn’t clear to see at all. Which doesn’t exactly track with the warnings from other characters about The Sinnerman and the kind of guy he is. Plus, considering how much Lucifer has tied his lack of Devil face and his new regenerative angel wings to The Sinnerman, we still don’t even get confirmation on that one. Yes, we get The Sinnerman confirming he knows Lucifer is the Devil (and he knows about the desire thing), and Lucifer even brings up those things when speaking with him… but The Sinnerman simply continues on with his pontification without actually acknowledging these major issues. Is he a walking contradiction? Because that’s a different approach to a villain, but it’s also maddening to try to understand after all the build-up. There is certainly a disturbing terror that comes from the kind of man who would blind himself—without displaying any sense of pain—to avoid letting Lucifer know his true desires. From the kind of man who perfectly orchestrates murders the way he does here. But how is that same man also sloppy enough to leave DNA evidence behind at all of his crime scenes? Keep in mind, he wants to draw Lucifer to the trap, but he just calls him on his cell phone to do that. The rest of this episode’s plots and character beats are more straightforward in their building (and breaking down) for the future, which is necessary to keep things moving. For starters, there’s the Chloe stuff, both with Lieutenant Pierce and Charlotte Richards. In terms of her relationship with the former, this episode brings the show dangerously close to overplaying the awkwardness of Chloe around Pierce. But once it gets to the stakeout, things settle down and Chloe gets back to reminding the audience she knows what she’s talking about most of the time. The stakeout also brings a couple of Pierce points into context, which is necessary with a character who essentially had to be written off to accommodate some episode rescheduling. First, there’s the fact that Pierce’s terse reaction to Chloe’s early episode request for a “personal day” wasn’t just an example of him being out to get her: He seriously was behind on work after being in the hospital for as long as he was and was working to catch up on everything, including the calendar to check the schedule. (He basically tells her this in the beginning of the original scene, but he gets to be more cordial about it when they’re on the stakeout.) There’s also the narrative choice of having it be his brother that The Sinnerman killed, instead of going the typical and played out love interest route. That’s an important choice to make if you’re going to go with this kind of backstory, and Lucifer is an aware enough show at this point to know how to handle it. Regardless of who in Pierce’s life was killed, this revelation does allow Chloe to pay her own experience (confronting her father’s murderer) forward to Pierce as they discuss what he’s going to do when he finally catches The Sinnerman. It’s a moment that’s certainly a far better use of the character than her awkward interactions with Pierce, although her moment of ogling him carrying a desk is perfectly understandable. As for Chloe and Charlotte, their interactions in this episode serve as a reminder of why Charlotte’s road to redemption with the LAPD crew isn’t going to be as easy as she wants it to be. And it’s not just because she defended high-profile criminals, since even with her missing time, she knows that’s something she did before. What Charlotte doesn’t know are the specific reasons why Chloe and company take that so personally. It’s easy to conflate so many things about “Charlotte” into why Chloe has problems with her, but this episode reminds us all of the reason Chloe is not a member of the Charlotte Richards’ Redemption fan club: “Charlotte” defended Chloe’s father’s murderer and got him out of prison. She also used Dan to help her do so and went after the Chloe/Lucifer relationship in the process. 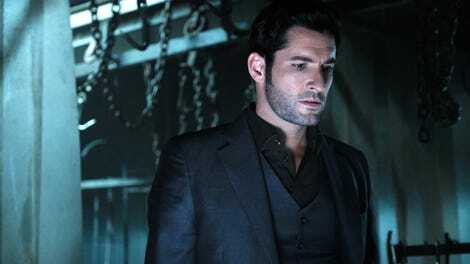 Lucifer of course knows it wasn’t the real Charlotte Richards who did those things, so he’s on her side. But for the rest of them, there’s no reason to be on her side or to believe that this whole redemption thing is legit. However, Dan being the one to give Charlotte the men’s bathroom pep talk is still important, not just because of their weird relationship but because of Dan’s past as a crooked cop. I’ve written a lot about how the show worked a miracle in redeeming and rehabilitating the character, but it truly matters that it remembers and acknowledges how he wasn’t always such a great guy. So for Dan to use his own bad guy past to prove to Charlotte that she’s not a lost cause—redemption’s just a lot of work and doesn’t come with gold stars—that means a lot for both characters. Then you have Linda and Amenadiel, who are also doing their best work together and slowly realizing that. They’ve been spending a lot of time together lately, confiding in each other and getting through their own existential crises side-by-side. They’ve had to be each other’s best friends, because it’s not like Maze has been around (she got banned in Ohio!) or Amenadiel has been talking to Lucifer. But “The Sinnerman” asks, would it be such a bad thing if they were more than friends? Given the weight Linda feels by being the one human completely in on all this celestial stuff, it makes sense that she would gravitate to someone who she won’t have to hide it from. And given Amenadiel’s outsider status when it comes to humanity—a point he explains in this episode—it also makes sense that he would gravitate to the one human who doesn’t make him feel like an outsider at all. Really, where the trouble with this pairing comes is in the return of the Maze. Not only is Maze the one who technically gets them to confront and confirm their feelings for each other, she’s the only one who has a problem with it. A really big problem, as she spends the majority of her return desperate to vent to Lucifer about it. Thankfully, “The Sinnerman” makes clear that Maze’s motivation here isn’t so much jealousy due to broken “girl code” as it is her not wanting to be left out of things. It also shows just how much things have changed from season one to now, as it even makes sense that she doesn’t want Amenadiel back—she just doesn’t want to be the third wheel to her best friend and her ex. Just in the scene between the three of them, the way Amenadiel and Linda go on about the “Angel School” concept and how amused they are by it: They’re already doing the couples exclusion thing, without even being a couple. (“Angel School” is funny, but it’s not that funny, you know?) We just saw Maze choose her family and life in LA over a guy she really connected with. So what would it say to her if Linda chose Amenadiel despite her valid protestation? “The Sinnerman” is an episode of questions. Not all of them are as frustrating as the questions about The Sinnerman himself, but all of them make an interesting set-up for the next episode. Especially Maze’s hair, which isn’t so much a question as it is a bold statement. However, as confusing as The Sinnerman’s entire existence comes off here, it’s impossible to deny Kevin Carroll’s performance throughout this episode. Specifically in the scene where he’s literally acting against Tom Ellis from within a monitor. That scene alone promises something fascinating with this Sinnerman story, even if it’s still unclear what it all means. A bizarre, demented game of chess, perhaps, as Lucifer struggles to find The Sinnerman’s weakness and/or his motivation. All of this is building to next week’s midseason finale, and that’s exactly what this plot feels like: a lot of building. What it’s building to is the final question. Lucifer and Amenadiel made jokes about it, but Linda was asking some good questions about angels’ abilities and how who gets which one. I appreciate that you could tell Joey wanted to be “a Scarface for millennials” before Lucifer even said it because of all the tacky art on his walls. Pierce: “He kills for power and influence. Taunting a nightclub owner seems petty. Small.” It’s understandable that Pierce thinks Lucifer is just a vain idiot, but you’d think he’d at least realize or acknowledge that Lucifer is a man with a lot of power and influence in Los Angeles. He uses that power and influence mostly to party, but it still exists. On the other hand, Lucifer continues to be disappointed whenever Pierce ends up helping Chloe, but Lucifer is the one who keeps bailing in the middle of cases to do his own thing in the first place. Surprisingly, Franky The Knife is quite an interesting character for just being a “mob guy.” The story about Joey actually being good at his work for the mob—and them taking to him like true family—is strangely touching, given the whole mob thing. And the fact that Joey used his favor from Lucifer to join the mob. Lucifer sure knows how to make the oddest things sentimental. Nice job, Tricia Helfer: When Chloe tells Pierce she needs Charlotte, Charlotte is trying (and failing) to drink the terrible LAPD coffee. That’s the taste of public service, Charlotte. Charlotte: “I suppose… I do.” I wonder if Charlotte will look through her cases from her soul sabbatical—really look through them—and realize what she did to Chloe. Because I can’t imagine she’s put two and two together. Lucifer: “Oh, also, it’s Lucifer.” As though Amenadiel would assume another British man would ring him up and call him “Brother.” Obviously the brothers haven’t resolved their issues, but it is nice to see Lucifer wanted Amenadiel to join him on his Sinnerman hunt. I don’t typically watch the promos, but after this episode (and all the questions I had from it), I decided to watch the one for next week. It turns out it brings up a another question I had from The Sinnerman’s depiction in this episode. However, this review is just based on what happens here and what we know from before.